I'm a diehard Nelson DeMille fan and have been buying his novels on the day of release since I discovered his writing. Wild Fire has all the sarcasm and stoic persistance I've come to expect. Maybe CIA Ted can stay dead this time? Please bring the REAL John Corey back! Now I like Nelson DeMille a lot. I've read all his books (save The Gate House; waiting for it to arrive). My favorite is "Plum Island" in part due to the story and in part due to John Corey, that wiseacre ex-NY PD detective. The John Corey stories, alas, have gone downhill since the days he chased Captain Kidd's treasure. 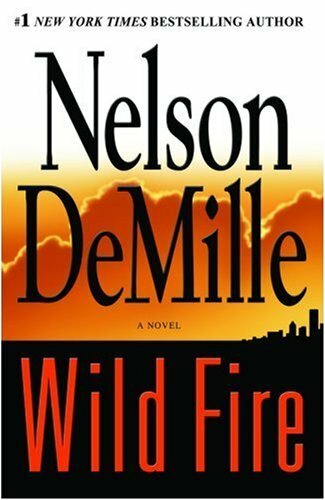 I thought "Nightfall" had no real ending, and I though "Wild Fire" had an implausible ending within a truly implausible story. I won't be a spoiler here; I will say I could not put the book down despite the implausible story but it was still unsatisfying due to its ending. I find Kate Mayfield an improbable match for John Corey's character (if you read "Plum Island," you'll see why); her preachiness against John's rogue behavior becomes positively revolting when she joins him in rebelling against authority (something they did together in "Nightfall" too). By the middle of this book, I wanted to kill John Corey. All the stupid exchanges with his wife/partner got a little old. It is time for this character to go away. Completely implausible. In fact I was wondering when the wife was going to kill him in his sleep. I liked DeMille's earlier work. I liked Lion, Spencerville and General's Daughter. This is far from the best Nelson DeMille book I have read. The protagonists are unlike-able, the villain is straight out of James Bond. It's like a spoof of James Bond flicks -- think Austin Powers. Despite having ample opportunities to simply kill the good guys outright, the villain has to (for umpteen pages) try to impress the good guys with his cleverness, before killing them. This happens twice -- once after the capture of Harry Muller, and again after the capture of Corey and Kate. The dialog between John Corey and everybody else is getting old. It isn't fresh and funny, it's just tired. Maybe I've read too much DeMille. If this your first book of his, it might be surprising and rapier-witted. Traditionally, DeMille has written excellent thrillers with unexpected plot twists & generally witty dialogue between Corey and the antagonists. This book has absolutely none of those characteristics. Fiction writers are generally afforded a lenient artistic license allowing them to stitch otherwise ludicrous plots together. This book takes those liberties and abuses them to the fullest. Under no circumstances is the plot of this novel made believable to the reader. Proper writing along with effective plot development can make nearly any scenario appear realistic, DeMille fails miserably at this task. Corey is not up to his usual self in the book. The other characters offer no intrigue. Unlike the villains in his other books, Bain offers us no insight as to why he is such a lunatic. His cache of supporters are all merely "present", there is no effort on DeMille's part to explain to the readers why they have all gone mad. It isn't often that a great plot and great humor are in one book. I appreciate sarcastic and ironic humor and appreciate many of John Corey's thoughts. For instance I thought he was pretty right on with his B&B views. I listened to Scott Brick's narration and had a problem turning the iPod off. There is a bit of technical detail in the book (which some may find boring) and I learned quite a bit - some of it I would probably sleep better not knowing. :-)Although some of the discussions may seem long (because you really want to find out what is going to happen) they seemed frighteningly real. I really wanted to like this book, but it was actually annoying. I really liked John Corey in Plum Island, less so in the Lion's Game, and hated him in Wildfire. the wisecracking was way over the top, and his wife came off as a lame straightman/sidekick. I read this book several months ago but held off writing a review, hoping my first impressions would improve with time. Alas, not so. De Mille's books are usually a reliable mixture of snappy dialogue and fast paced plots. The snappy dialogue is here in spades; John Corey is married and he and Kate engage in the usual banter. However, de Mille seems to think this is a substitute for a well thought-out plot. In this book we meet the bad guys (more on that later) and they proceed to lay out their plans in endless detail. In fact, the first 100 pages (at least it seemed that long) consist of the evil doers explaining all in a meeting that is laughable. We find that the bad guys (no spoiler here) intend to nuke one of our major cities. Just which one requires pages of discussion. Once this meeting concludes the pace does pick up, but the "action" seems to consist of John and Kate driving around the countryside. Now a word about the perps. Every author is entitled to his or her choice of bad guys. Is does help, however, if the choices are plausible and don't require too much of a stretch of ones imagination. In this case the proposed deed is the setting off of a nuclear device in one of our cities. Given recent history, one might suppose that this might be the work of Arab terrorists, etc. Not so. Here we have members of the FBI, CIA, and State Department. Heading up this group is, of course, a representative of the most evil group of all - - big oil. I was very excited when this book was offered as a prize in my library's summer reading program. I had often seen this author in the bookstores and had never read him, so I thought it was a great opportunity. I selected this book and eagerly began reading. After finishing this book, my primary reaction is that I will never read another. The only thing that saved this from receiving a one star rating was the premise. The general story was great and I thought I was in for a wonderful read, only to be greatly disappointed. The writing is very, very bad. The dialogue is stilted and the main characters "solve" the problem in a way that has no plausabiliy. I was a bit concerned close to the beginning where a federal agent has been caught trespassing and is brought into a meeting of the "bad guys" where the entire plot is explained to him. This is supposed to be a meeting of the major players who have been involved since the beginning, but the leader of the ring explains things like one would do a group of elementary school children. They also immediately begin feeling uncomfortable about what they are going to do even though this has been in the works for years. What a contrived situation. The hero of the book (John Corey) also is totally unrealistic and very irritating the farther along you read in the book. While some wisecracks make sense and help develop his character, there is NOTHING said in the dialogue that doesn't result in a wisercack. At some point, facing proabable death (and the death of his wife), I think he would have SOME serious thoughts or ideas. It just doesn't ring true. He also manages to "solve" the mystery/problem without much data and magically figures the whole thing out. If this is representative of his work, I'll not be reading another. There are too many good books in the world to waste time on this ! AWESOME! Exciting and in parts made me laugh out loud. Nelson DeMille is one of the best writers in the business, bar none. He delivers captivating stories, non-stop action, interesting characters and spices it all up with a bit of humor. "Wildfire" is no exception but this time the humor is sometimes a little strained and contrived, and at times annoying. John Corey and his FBI agent wife Kate make an exciting couple and yield good stories, but this is about the fourth novel with them as the principle characters and I would like to see Mr. DeMille give us a couple of books with different protaginists. He can bring back John and Kate anytime, but something different would be a welcome change. I have read most of DeMille novels. The early ones: Plum Island, the Gold Coast, the General's Daughter, and later, the Lion's Game, to mention a few, were all terrific and rated at least 4 stars. His later novels have really been disappointing. Suspenseful, exciting and at times hysterical! You call this a thriller! ?